The 3D duel-fest is back, and attempting to answer some of the questions from its first installment (and a few major updates). 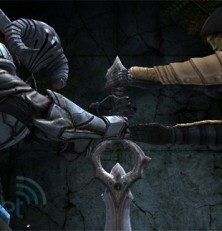 Infinity Blade had a huge effect on promoting the iPad and iPhone as valid gaming options, with superiority visuals and intuitive touchscreen controls. Well, Epic hasn’t tampered with the formula overmuch, but has tried to instill some considered expansions and pour even more eye-honey all over it. Will it stretch gamers beyond the original? The game follows on from the end of the first game, the protagonist now wielding the Infinity Blade and attempting to finish the ruling Deathless once and for all. Unsurprisingly, his plans soon come unstuck, and you start anew with bottom-rung equipment and skills.You also now have the curious honor of naming the hero as you please. We stuck with the staple Siris, a thinly veiled nod to the voice assistant of Apple’s latest smartphone. We’ll leave the narrative to reveal itself, but the sequel has done away with those “nordish” voices of old, with a very swift transition within the first ten seconds to English voice actors. Purists may scream that it’s a dumb-down, but we felt a little more involved in the plot exposition. Sound is suitably grand, although you will tire of the same grunts and huffs by the hundredth battle. While the battles themselves remain, at their core, pretty similar to the first release, there are now three different weapon styles. There’s the typical sword and shield combo from Infinity Blade, a high damage (but slower) two-handed weapon where defense is now exclusively block-based and dual-wielding weapons for faster attacks with defense limited to dodges. You’ll find a style that suits, although overall damage is less of an issue, and it’s more decided by your preferred method of damage limitation. The power attacks that charge up during fights will also differ between the three weapon classes. A new customizable option for weapons and armor, gems, now add extra elemental damage and defenses. Depending on which jewels you embed, you can also increase the spoils of battle with extra money or higher chances of equipment drops. Journeying around the stages of Infinity Blade 2 will take you from oriental temples with plenty of eastern style licks, to what appears to be the increasingly ruined locale of the first game. They’ve cranked up the light effects here, so expect to be impressed all over again if you were wowed by the original. Granted, it can’t stun players with the same “a phone’s capable of this?” sort of way, but the game is noticeably sharper, taking full advantage of the high-resolution screens of the Apple hardware. Load times barely ever get in the way, although they are slightly more pronounced on the older iPhone 4 and original iPad. Any difference between devices seems negligible from the time we spent playing on the original hardware — we did, however, play most of this review slashing away at the screen of our iPhone 4S. The gameplay is still very well suited to mobile devices — you can literally spend a minute exploring and fighting, lock your phone, make a phone call and jump back in where you left off. There’s still room for improvement — the game rewards obsessive replay, and it can get veryrepetitive, although Infinity Blade 2 does attempt to add more variety to its character designs (female baddies! ), kill animations and wacky helmets. If you’re looking to get to the ending, you can skip ahead by exchanging your real-world money for in-game gold, but even then, you should find plenty of gaming hours here — it took us over a week of concentrated gaming to go through the whole storyline. Unfortunately, the multiplayer option found on the original app hasn’t yet been translated to this release, although it’s already earmarked a space in the game menus, promising to reward challengers with in-game goodies. Similarly, updates are already in the pipeline and the makers are promising more creatures to slice and more weapons to dice them with. Infinity Blade 2 is, in no uncertain terms, a sequel. If you weren’t drawn into obsessing over beating the Deathless in the first game, then you’re not going to be converted here. It looks like a console game, but there certainly isn’t the same level of depth or longevity. However, the new game arc does force you to explore the labyrinthine screens, even if only in a point-and-tap way, and the character customization and expanded fight system does allow you change and tweak your character to your tastes. 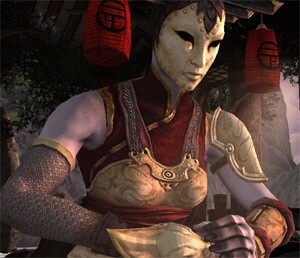 The game is sumptuous, with textures and lighting effects pushed beyond what we saw almost exactly this time last year. $6.99 is a very good price for one of the grandest — and technically greatest — gaming challenges available on the iPhone, iPad iOS 5 or later.